In 1980, Bruce Rowland convinced a friend to give him a copy of the script for the upcoming film adaptation of Banjo Patterson’s classic Australian poem, The Man from Snowy River. An aspiring film composer, Bruce was captivated by this classic story of romance in the Australian bush, and determined to try his hand at creating the score. Bruce experimented with multiple ideas for the soundtrack, none of which he was happy with. After a frustrating afternoon in the middle of winter, Bruce went to bed, only to wake suddenly at 3:00am. Bruce went outside to his studio, sat at his piano, and in one take played and recorded Jessica’s Theme, which would go on to become one of the most beloved and recognisable tracks in Australian film. When director George Miller listened to Bruce’s demonstration track for the first time, he was instantly convinced that Bruce’s music was what he had been looking for. Bruce was hired to score his first feature film, and began a career as one of Australia’s most successful film composers. Since composing the score for The Man from Snowy River, Bruce has sustained a long and successful career in Australia and the United States. Much of Bruce’s work is instantly recognisable, characterised by emotional depth and evocative melodies. For Bruce, composition is about what feels right. He has an abiding interest in the marriage between music and visual images, and music’s ability to transport viewers through seasons, landscapes and emotions. Bruce is a skilled pianist and has a particular love for orchestral music and composition. He believes that the organic nature of orchestras is uniquely effective at eliciting the array of human emotions, ranging from love to sorrow, from hope to fear. Bruce’s career spans a multitude of motion pictures, cable movies, mini-series, series, animations and special live events, details of which can be found on this website. Bruce is the proud recipient of multiple awards, including a 2006 APRA International Achievement Award for his services to film. Career highlights include not only Bruce’s work for film, but also large scale live performances. In 2000, Bruce wrote and conducted the music for the Opening Ceremony of the Sydney Olympic Games, which included a special rendition of Bruce’s score for The Man from Snowy River. The performance was broadcast live to millions of viewers around the world and was one of the most challenging and rewarding moments of Bruce’s career. Bruce’s fascination with music began as a child. He grew up in a musical household in Melbourne, and as a teenager studied piano and played with various pop bands. He worked with pop group The Strangers during the 1960s, and has toured with international artists including Roy Orbison and The Beach Boys. 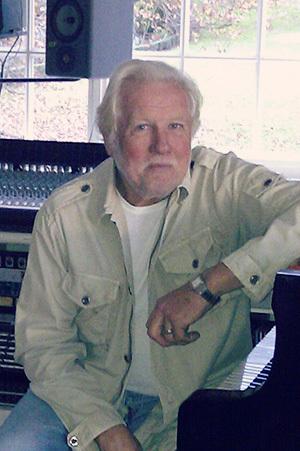 Bruce developed much of his early skill as a composer on the popular teenage television series The Go Show, where he was responsible for playing keyboard and writing arrangements for guest artists including Olivia Newton-John and Billy Thorpe. Later, Bruce worked for five years as the composer for children’s television programs Magic Circle Club and Adventure Island, where he was expected to write ten songs a week for fifty weeks of the year. He has also written over 2,000 advertising jingles. Bruce credits these early professional experiences for providing him with valuable skills working with orchestras and learning how to create emotion through music. Since those early days, Bruce has never stopped learning about music. Bruce works in Melbourne and Los Angeles, and when not busy in his studio enjoys spending time with his family and on the rural property he shares with his wife.